Guava is a tropical fruit, a seasonal fruit with high in nutrients. It has a unique, distinctive flavor and taste. It is commonly known as Amrood. It has green, yellow, or maroon skins, a creamy pulp of white or pink and hard tiny seeds at the center. It is one of the least chemically treated and sprayed fruit. 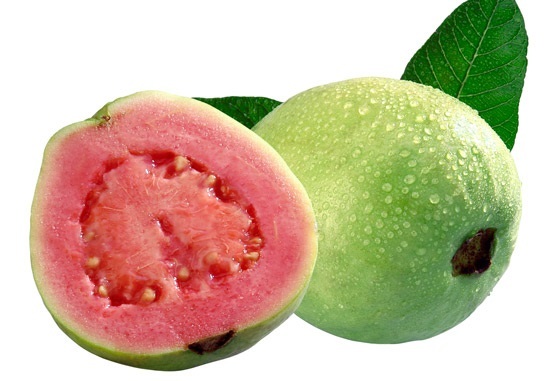 Let’s see some of the amazing health benefits of Guava Fruit here on this page. Lowers Diabetes Risk and Cleaned System: Guavas are rich in fibres which is important for lowering the blood sugar levels. It is important to make your system stays clean. This fruit is good in cleansing digestive system and maintaining free bowel movement. Rich in Nutritive Value: Guava is a rich source of vitamins and minerals. It contains approximately five times more Vitamin C than an orange. It also possesses vitamins A and B and is also rich in Calcium, Nicotinic Acid, Phosphorous, Potassium, Iron, Folic Acid, Fiber, etc. Improve Vision – Health Benefits of Guava Fruit: Although, guavas are not as rich in Vitamin A as the carrots, they still are a very good source of the nutrient. Vitamin A rich diet helps to keep your eyes in good condition and improves vision. Night blindness is one of the diseases associated with a Vitamin A deficiency. Keeps Your Mind Healthy: It helps to keep your brain functions positive by maintaining good blood flow and also by infusing it with Vitamin B3 and Vitamin B6. Vitamin B6 is pyridoxine which is good for nerves. It keeps your nerves relaxed. Health Benefits of Guava as a Stress Buster: The magnesium present in Guavas helps to relax the muscles and nerves of the body. So after a hard workout or a long day at the office, a Guava is certainly what you need to relax your muscles, combat stress and give your system a good energy boost.